When we watched Uma Thurman will herself back to life in Kill Bill after those initial painstaking toe movements, what we didn’t stop to consider was that the yellow jumpsuit-wearing martial arts master was using a stunt double most of the time. Her name is Zoë Bell. A 31-year-old Kiwi, and she has also doubled for Xena: Warrior Princess, and had acting roles in Death Proof, Lost, and Whip It. 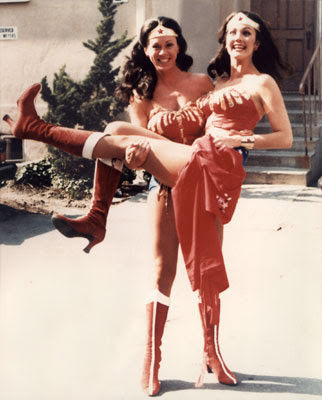 Bell is the new breed of stunt woman, mentored by old school veterans, like Jeannie Epper, Lynda Carter’s double for Wonder Woman, and current head of the Stunt Women’s Association of Motion Pictures. 2005’s Double Dare, screening tomorrow night in New York as part of the Stranger than Fiction series at IFC, tells their danger-defying stories and offers us all seven helpful hints for getting through life. 1. It’s much harder to get the job than to do the job. According to these adventuresome women (who back flip off of 30-foot ladders), doing your job is not that hard. It’s easy to crash your car into a building; impressing someone enough to make them want to hire you is much harder. In this case, the buddy system helps. Nepotism rules. 2. They’ll like you if you’re tough. Act fearless. Even if you fall down a bunch of times, like Bell did when auditioning for Kill Bill, as long as you get up quickly and keenly fall again, people will like you. The boss in this case, Quentin Tarantino, likes someone who can take a beating. 3. You have to be a little crazy. Fight crazy with crazy; don’t walk around being rational and reasonable and expect that to get you anywhere. To feel truly alive, we all need to be lit on fire every once in a while. Jeannie Epper gave a friend one of her vital organs. While we’re not insisting that you go that far, do whatever it takes to be a good friend — because you never know when you’re going to need to a patient convalescence nurse. 5. If no one’s looking out for you, form a union and look out for yourself. Organize, organize, organize. That’s what Epper did and it paid off. At 60 plus, she’s still running stunts with the best of them. Don’t let anybody tell you that any job is not for women. If they do, show them this. The final, and most important lesson is a quote from Bell. Being a grownup does not mean that you have to be boring and stop having fun. If you don’t want to do the 9 to 5 thing, don’t do it. For sure you have some amazing hidden talent that you can mine. Maybe you’re great at jumping into glass windows, or maybe you should start your own cupcake business. Whatever you do, be sure to take a risk. Watch a trailer for Double Dare below.